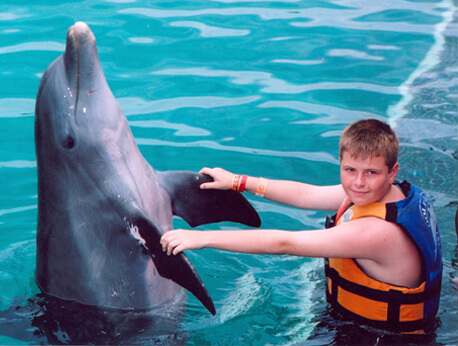 Dolphin Discovery's Swim Adventure Plus in Riviera Maya Puerto Aventuras is the ideal way to learn about and commune with bottlenose dolphins. The adventure allows participants to swim and interact with the facility's dolphins while also learning about their natural habitats. Participants also get a chance to interact with manatees and go snorkeling. For the perfect entertainment and the adventure of a lifetime, schedule a Swim Adventure Plus with Dolphin Discovery during your stay in Riviera Maya Puerto Aventuras. No holiday is complete here without spending time in the water, so why not spend part of it with some of the world's most intelligent mammals, the bottlenose dolphins! Immerse yourself literally and figuratively with marine life as you'll get closer to these sea creatures than you ever imagined. You've heard that swimming with the dolphins is an unparalleled experience, so take advantage of the opportunity to do so yourself. You'll see dolphins in an entirely different way as you not only swim but also interact with them. One of the highlights of the Swim Adventure Plus program is the belly ride where you grab onto your dolphin's fins as he or she swims backwards. It's sure to make you giggle with glee. You'll also experience these wonderful mammals saying hello with their fins, getting a boogie push, and even being hugged by the dolphins. They'll also delight you with a song and a dance, dolphin style, of course. Once you've spent time with the dolphins, continue your adventure with 15 minutes of interaction with our manatees where you'll get more hugs. Afterward, you'll have time to go snorkeling along the world's second largest reef. Swim Adventure Plus excursions run daily at 9 a.m. and 1 p.m. at a price of $139 for adults and $89 for children ages six to 12. Contact the facility about rule and prices for children ages five and under. Your adventure includes transportation to and from most Riviera Maya hotels to Puerto Aventuras Marina, a 25-minute briefing followed by 50 minutes in the water with the dolphins, another 15 minutes with the manatees, and 90 minutes on our catamaran to and from the snorkeling location. Catamaran rides are not available on Sundays and are subject to weather conditions. Each person will also receive a buffet meal and two non-alcoholic drinks. Children younger than 10 must swim with a paid adult aged 18 or older. Infants can swim free with two paying adults. Children eight years and younger will be restricted to the kiss, hand target and handshake activities with the dolphins. Life jackets are required for all participants. Women less than five months into a pregnancy can participate after signing a consent form and when accompanied by another adult, but those further along in their pregnancies cannot. Participants should try to arrive at least 30 minutes before the start of the adventure to get the most out of the program. In Puerto Aventuras, groups have a maximum of 12 people for a closer experience. The use of life jacket's required in all water programs. If you have any health or physical problem please contact our call center before you make your reservation so we can provide you full information about our services.